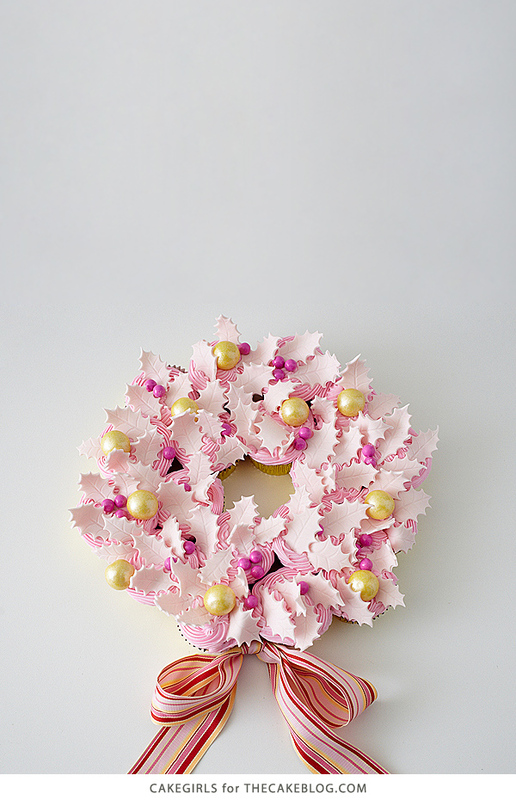 Christmas Cupcake Wreath! 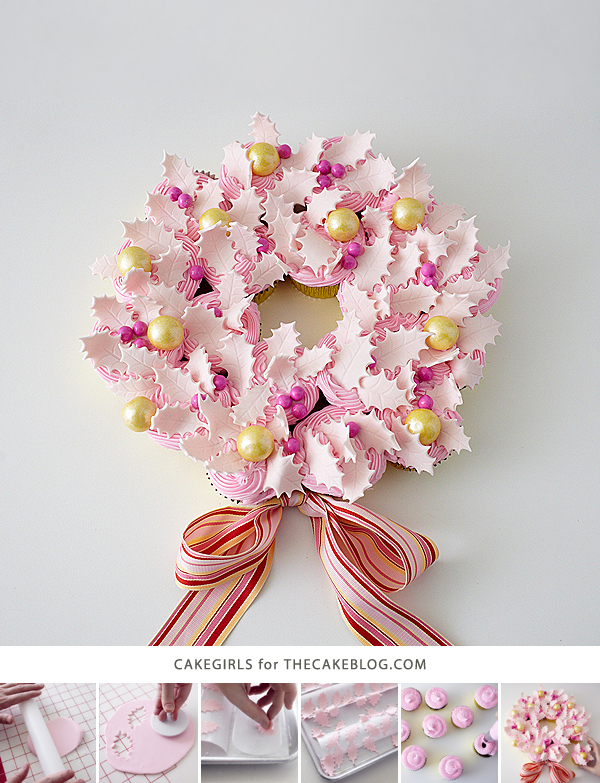 Learn how to make this pull apart cake that looks just like a wreath with a simple step-by-step tutorial by our contributors, Mary and Brenda Maher of Cakegirls. Every Christmas season I plan on spending quality time with my sister over homemade hot cocoa, making sugar cookies with my kids, spending a snowy evening window shopping on Michigan Avenue with my husband and creating a fabulous cake to present at my friend of choice’s Christmas party. Every Christmas season, most of this doesn’t happen, I feel like I’m rushing to get things done, scrambling to purchase last minute gifts and much of the season becomes a total stress fest. Well, this year, I’m letting myself off the hook. I’m crossing a few of those things off my list before I even get started, I’m scaling back and lowering some expectations. I mean, after all, the joy of the Christmas season is really about spending time with friends and family. 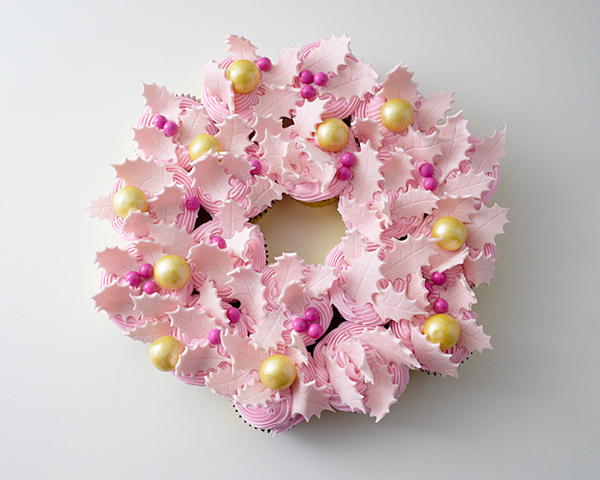 So, that’s pretty much why I love this Cupcake Wreath Project. 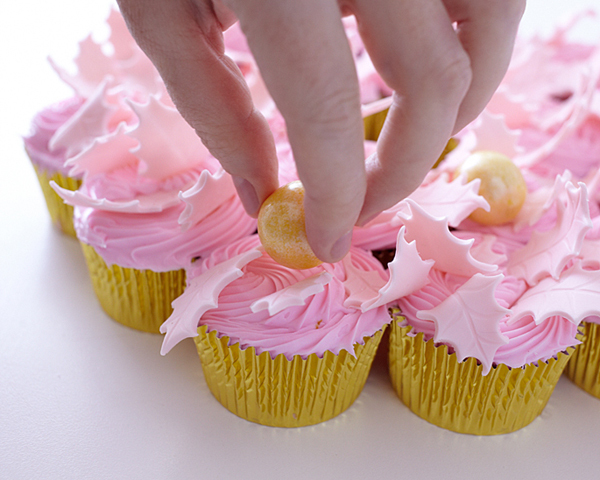 You can use a cake mix and store bought frosting. You can bake ahead and then pull out frozen cupcakes and make this project happen. You can even buy pre-made cupcakes from the grocery store. See where I’m going with this? The leaves can be made a few days ahead as well and the best part about this dessert is that it’s a pull apart cake. Present it on a platter and let your guests disassemble it. No knives, no messy cake servings. Just a stunning, wow your guests, stress free, Christmas dessert. Using the pink gel paste, tint 1 pound of the fondant pale pink. 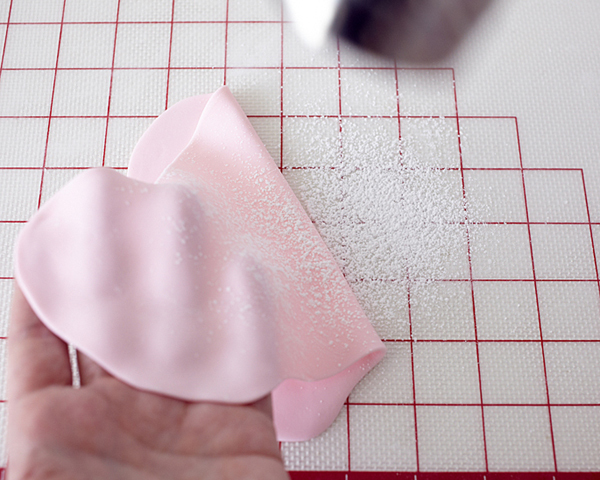 On a rolling surface dusted with powdered sugar, roll out a handful of the pink fondant to 1/8″ thickness. Lift the sheet of fondant up and sprinkle a little more sugar underneath and a touch on top and spread it around with the palm of your hand. 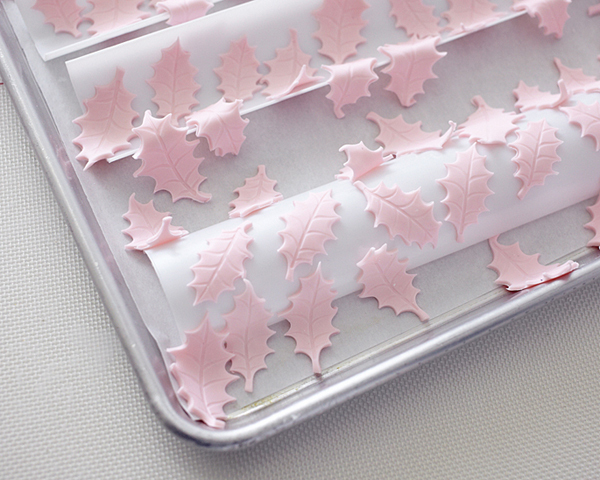 You want the surface to be dry which will make cutting and stamping the leaves easier. 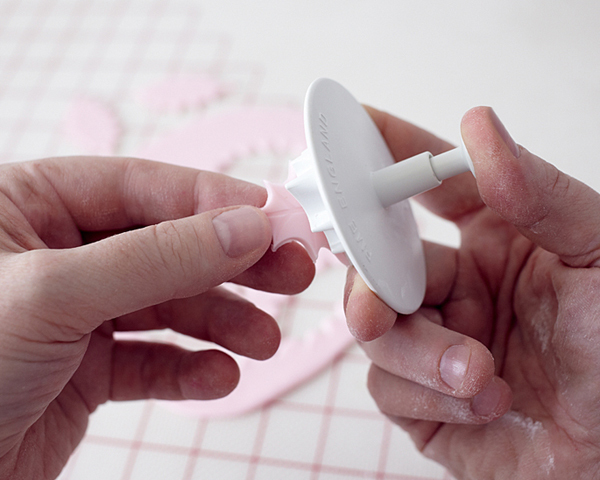 Use the holly cutter to cut out a leaf, then gently press the plunger down to create a stamped impression. Lift and fully press the plunger to remove the entire leaf. Place bunched up plastic wrap, rolled up pieces of paper towel (or use actual flower former half tubes if you have them on hand) on a sheet tray. Sprinkle the surface with powdered sugar. 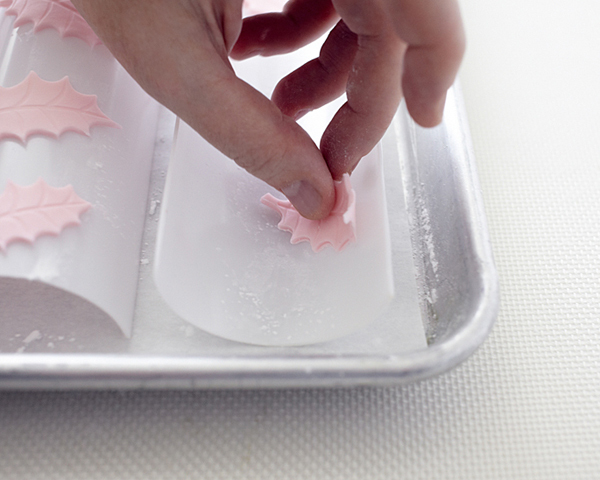 Place the fondant leaves on the formers and edge of the tray to give them a curved shape. 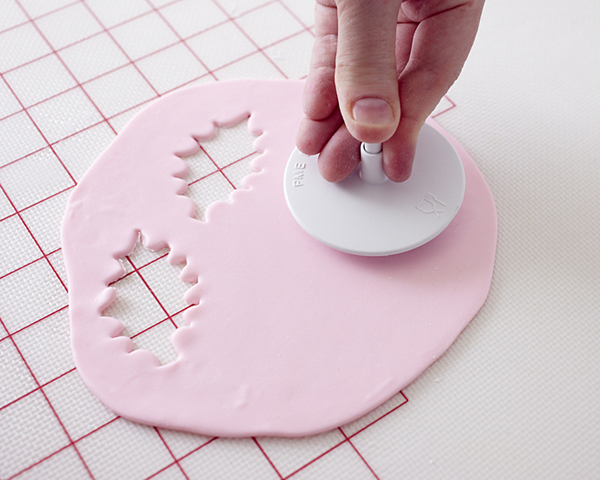 Repeat with various size cutters and the remaining pink fondant until the sheet tray is full. This wreath will require approximately 80 leaves, but make a few extra for breakage. Let the tray dry overnight. 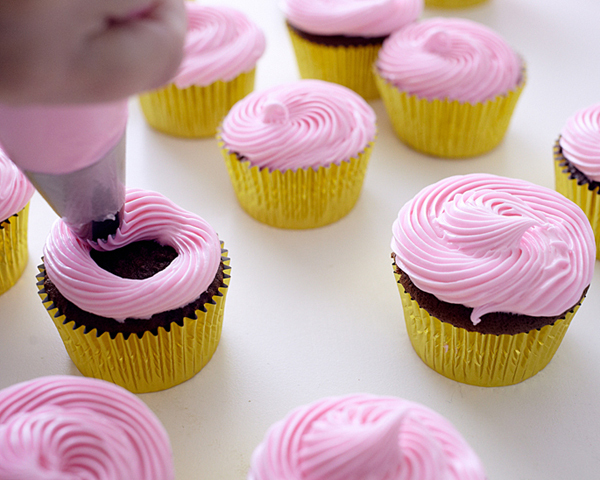 Tint the icing a shade of pink darker than the fondant. 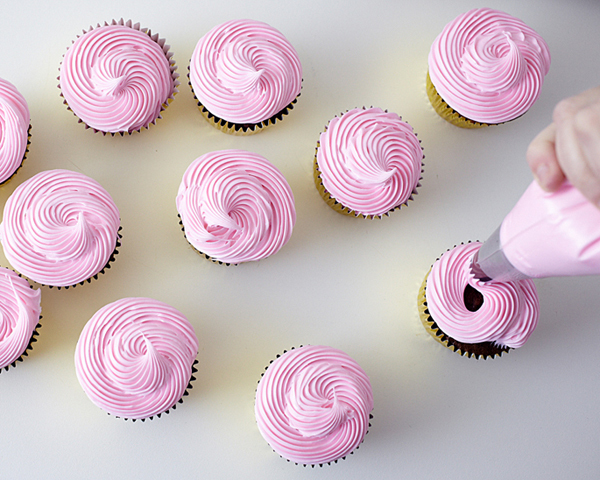 Frost the cupcakes with a swirl of icing. 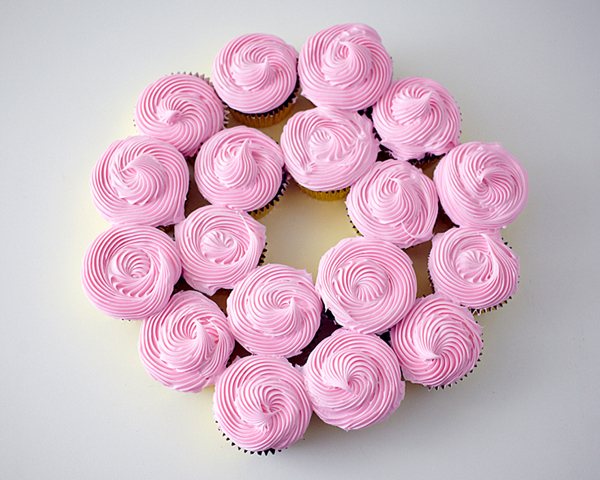 On a serving platter, place the cupcakes in a ring with 12 on the outside and 6 on the inside. 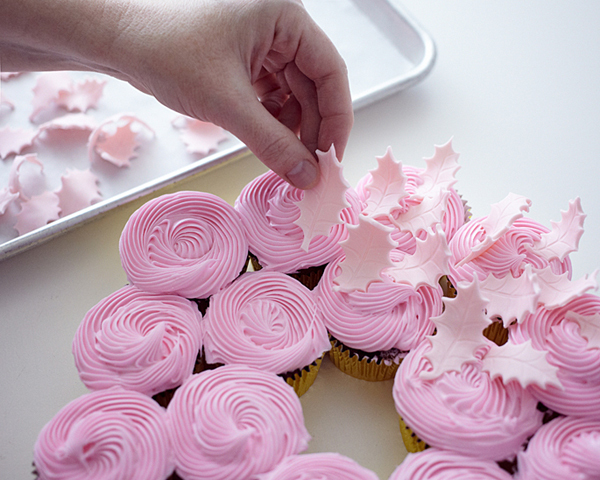 Place the fondant leaves on the cupcakes facing in different directions to give the wreath texture. 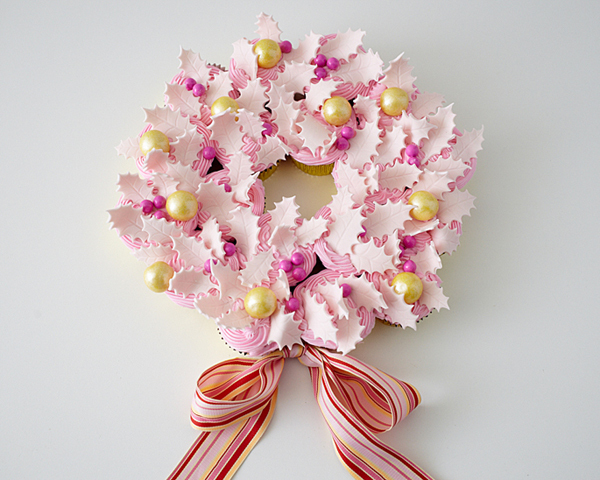 Place the gold gum balls around the wreath where you’d like and then go back and add the hot pink sixlets next. Adorn the cake with a tied ribbon propped at the bottom if you like. 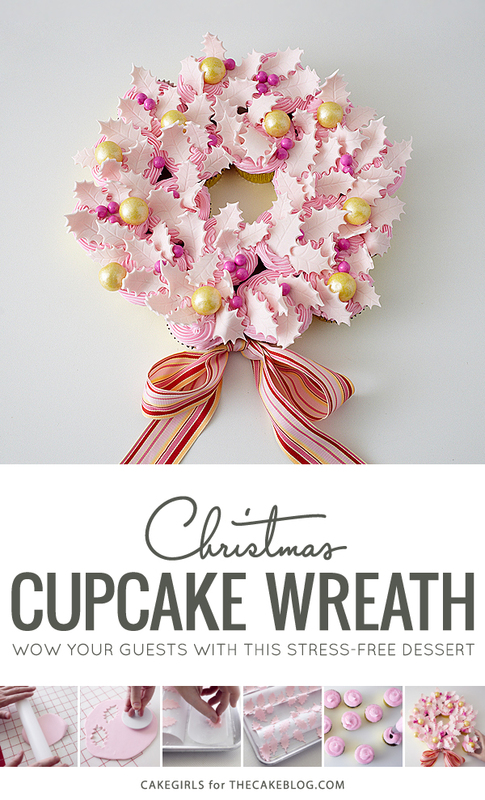 Absolutely love the Christmas Cupcake Wreath tutorial! My girls love to eat fondant. If we did this project together, maybe it would be an incentive to make something out of fondant and not just want to eat it! 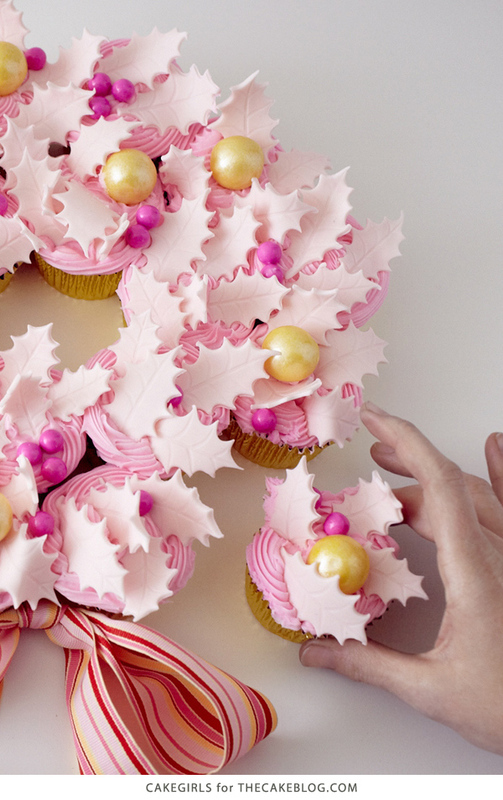 Definitely going to make this for Christmas! Thank you for all of the helpful tips! It’s so pretty! I love it… thank you for the tutorial. I’m going to give this a try.